This hearty Turkish soup has its own story. This hearty soup is wonderful to eat on a cold winter day. Originally from southeast Anatolia, the origin of this soup is attributed to an exceptionally beautiful woman named Ezo, who lived in the village of Dokuzyol near Gaziantep in the early 20th c. Legend has it that Ezo, with her rosy cheeks and black hair, was admired by travelers along the caravan route who stopped to rest in her village. Many men longed for her hand in marriage and Ezo’s family hoped to secure a worthy match for their daughter. Unfortunately, Ezo the bride (gelin), didn’t have much luck when it came to finding marital bliss. Her first husband was in love with another woman and she divorced him on grounds of maltreatment. Her second marriage took her to Syria where she became homesick for her village and had to deal with a difficult mother-in-law who couldn’t be pleased. It is for her, the story goes, that Ezo created this soup. After bearing 9 children, poor Ezo died of tuberculosis in the 1950s and has since become a Turkish legend, depicted in popular films and lamented in folksongs. Her name lives on in this popular soup, which is now traditionally fed to brides to sustain them for the uncertain future that lies. Add the garlic and onions to the saucepan and stir gently with a good wooden spoon. Turn down heat to low. Add 2 tablespoons of the tomato paste to the saucepan and stir until blends well. Add 1.5 cups of red lentils and add ¼ cup long grain basmati rice or bulgur and ¼ cup vermicelli , thoroughly washed and rinsed. Add 6 cups of chicken stock and stir well and simmer and boil it then turn the gas cook low flame. In another saucepan melt 1 tbsp of butter and then add dried mint and paprika and stir well and cook for 2 minutes . Then add this mint and paprika mix into the boiled soup and simmer further 10 minutes. Once the soup has finished cooking, remove from heat and let it cool for 10 minutes. 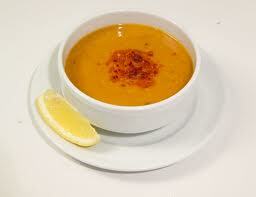 Ladle the soup into bowls and serve each with a lemon wedge and enjoy with a toasty hot slab of Turkish pitta bread.